What do you think that Helga would look like as an adult? Please do tell me if this is in the wrong spot, but I was just wondering what some of you think Helga might look like as an adult. I think that she'll have grown into her nose by the time that she's in her twenties, her hair will be long and wavy, she'll have an hourglass figure, and, I don't know why, but for some reason I like to think that her hair will actually get a little bit lighter as she ages (I know, it's weird.) That's just how I think she'll look in her early-late twenties. By the time that she's forty-three, I think that, if she's had kids by then (I headcanon that she'll have had 3 kids,) she'll have cut her hair to be shoulder-length (it'll still be a little bit wavy though,) her hair will start to darken a bit, perhaps becoming Miriam's color by the time she's nearing her early fifties, and she might get bags under her eyes since having three kids is likely quite exhausting. Those are just my thoughts, though. What do you guys think? Re: What do you think that Helga would look like as an adult? I kind of think she'd keep the unibrow, even though the depiction in Married shows otherwise. I don't have any super set ideas of how she looks. I like the idea of her hair darkening towards a Miriam color by the time she hits her forties, though. I also generally think she'll keep the unibrow for awhile, but start getting it waxed once she hits college-ish age and then probably as she gets older stop caring again. I like the idea that her eyebrows are always thick and dark though. I usually keep her slim and casually fit. I actually don't imagine her that crazy curvy. I really think she will probably not keep her unibrow at first (since her adult depiction in Married don't depict the unibrow), but then she grows it back sometime when they have their first kid. I think she might have the same hair color as Miriam in her 40s and she might have a similar body design (except for the head of course) and I think her clothes will often have white or pink (along with grey, blue and red) but of course it isn't the same clothes or something similar to the ones she wore in the show, like she can have a pink and red shirt while having some jeans on or something. Also I think that they'll have three kids or something around there. Life with the Shortmans (a fanfic) feels very canon to me and I really agree with its idea of having Helga and Arnold having three children. EDIT: Apparently I forgot about Amanda, sorry about the mistake on LWTS. Don't they have four kids in LwtS? My personal head canon is that they have twins on the first go and then stop (maaaaaybe a third kid like 10 years after the first two). The first time is 100% an accident and almost doesn't happen because Helga panics. But, in actuality I imagine them only having one kid. Helga is not a kid person and I don't see her having much interest in having any for a long time, if at all. I also feel like people think Helga would be an amazing mom, but I think it's something she'd really have to work at. In any AU where she doesn't happily get with Arnold, I do not really see her carrying a fetus to term. Zeether wrote: I kind of think she'd keep the unibrow, even though the depiction in Married shows otherwise. Interesting idea, Zeether! I personally feel that she'd keep the unibrow until sometime in college, but that her eyebrows would still be thick. LeSkuh wrote: I don't have any super set ideas of how she looks. I like the idea of her hair darkening towards a Miriam color by the time she hits her forties, though. I also generally think she'll keep the unibrow for awhile, but start getting it waxed once she hits college-ish age and then probably as she gets older stop caring again. I like the idea that her eyebrows are always thick and dark though. Glad that you like the darkening idea, and I totally agree with your idea on the waxing part! I think that maybe, after her first pregnancy, she might stop shaving for a while; if anyone asks her why, she'll just say something like, "I just had a baby, you idiot!" Yeah, sometimes I imagine an adult Helga as being Kim Kardashian-curvy, and other times I imagine her actually having more of Miriam's shape. If I'm really being honest, I think that Helga would likely have more of Miriam's body shape rather than being so curvy, but my views change from time to time. Jfgoofy wrote: I really think she will probably not keep her unibrow at first (since her adult depiction in Married don't depict the unibrow), but then she grows it back sometime when they have their first kid. I think she might have the same hair color as Miriam in her 40s and she might have a similar body design (except for the head of course) and I think her clothes will often have white or pink (along with grey, blue and red) but of course it isn't the same clothes or something similar to the ones she wore in the show, like she can have a pink and red shirt while having some jeans on or something. Also I think that they'll have three kids or something around there. Life with the Shortmans (a fanfic) feels very canon to me and I really agree with its idea of having Helga and Arnold having three children. That's actually exactly what I had in mind. I definitely agree with you there! As for clothing, I like to think that Helga will usually either wear leggings and a pink/blue/white button-up shirt around the house, and also occasionally wear a hot pink dress around. I like your idea for her clothing, but the only thing I might disagree with is the idea of her wearing jeans around. I don't know why, but I've always viewed Helga as someone who finds jeans to be a little uncomfortable, which is why I imagine her wearing leggings or a dress most of the time. Wait, I thought that there were 4 kids in LWTS? I think it was Zack, Phil, Amanda, and Ham? Personally, I like the idea of Helga and Arnold having one boy and two girls, with the boy being the oldest, but LWTS is a pretty cool fic, and always a fun read. LeSkuh wrote: Don't they have four kids in LwtS? Oh yeah I forgot! XD How come I forgot Amanda? That's quite the enthralling idea, LeSkuh! I don't know why, but I imagine that Helga and Arnold would first have a son when they're twenty-eight; three years later, when Helga's thirty-one, they'd have a daughter; and four years later, when Helga's thirty-five, they'd have another daughter, making for their last child. Yeah, I agree that it would take Helga a bit of work before she had what it really takes to become a mother, but in the end, I imagine that she'd be a pretty cool mom. 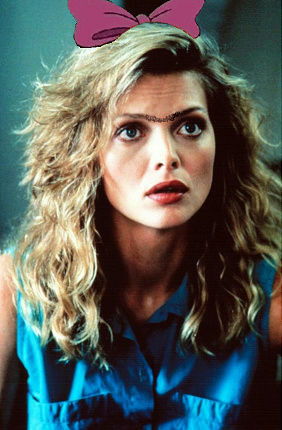 For some reason since I was younger I always imagined and older Helga looking like Michelle Pfeiffer looked in the 1980's but of course with a monobrow. blvrryfvce wrote: For some reason since I was younger I always imagined and older Helga looking like Michelle Pfeiffer looked in the 1980's but of course with a monobrow. Ha! Now I see Helga being Catwoman (from Batman Returns)! But yeah I wonder what it would look like if she looked like Michelle Pheiffer when she (Helga) was older. Thanks for sharing that by the way! I really like it! THIS IS PERFECT AND I LOVE IT.